I probably would have walked back through the park late this afternoon to pick up the urban assault vehicle, despite the fact that it was already getting dark, if I hadn't encountered that coyote this morning. At first I thought it was somebody's dog, getting too far away from its owner, taking a few too many liberties with the freedom offered by being in a provincial park. But as it got closer, I realized that it was, in fact, Canis latrans. My first reaction was delight. Although I often hear the chorus of the coyotes while lying in bed at night, I have only personally encountered them a handful of times, but never this close and never in broad daylight. It appeared to be standing and waiting for me to approach, so as I got closer, I veered off onto a parallel path that ran alongside the one on which the coyote waited, separated by about 20 feet of grassland. The coyote turned and walked the same direction as me, as I drew near to it, and so we walked along together. At this point I became a trifle concerned that perhaps it was stalking me, waiting for an opportunity to attack. Suddenly I was glad that I didn't have a Pomeranian tucked into my pocket, and I looked around for a large stick or something. Just in case, just to assert my dominance. Being smack in the middle of the open veld, the best that I could come up with was a handful of dry prairie grasses, or the pin from my lapel poppy. But then the coyote lost interest in me, its attention diverted by the rustling of rodents in the switchgrass. It began to leap playfully into the tall grasses lining the pathway, a beautifully fluid arc of wild dog, dancing for its breakfast. But late this afternoon, when it was time to retrieve the urban assault vehicle, I decided against returning through the park, having no desire to test my luck with a cougar or a bear at dusk. What wildlife have you encountered lately? Remember when that coyote bit those ugly girls and every full moon they'd dance atop a bar? At least I think that was the plot. As for my own wildlife encounters, you've already read my raven attacks recently. I'm hiding out in a bunker right now, so there haven't been any other encounters. I had a similar experience at Silver Creek Preserve in Idaho a few years ago. Parallel trails. I walked. Coyote walked. I stopped. Coyote stopped. It went on for several minutes and then suddenly Coyote lost interest and scampered away. "a beautifully fluid arc of wild dog, dancing for its breakfast." Amazing line, Barb. Love it. I haven't encountered any exciting wildlife lately other than spiders & insects trying to find a warm place to winter - in my house. Ugh. I haven't even seen a bear in a while, and the last time I saw a coyote was a year ago. Wait, I saw a squirrel the other day. Very exciting indeed. 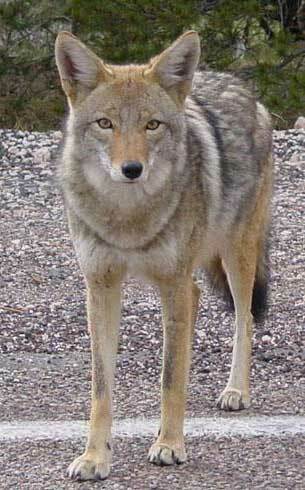 Coyote is the trickster. Are you up to mischief lately? Or do you want to be? A couple of nights ago, at dusk, I saw two raccoons less than a block from my building. They were wandering around like drunk frat boys looking for the nearest kegger. One lumbered across the street and the other climbed a tree. He was freakin' huge. Next time you see him tell him to come to Victoria. He could have a bunny feast on the grounds of UVic. @ Toccata: they are doing something about those bunnies, I see from my latest issue of the alumni magazine. They're supposed to keep the bunny population stable at 200 and sending all the extras to various rescue organizations all over the place. We have coyotes in the more open, undeveloped areas around here, but in my neighborhood we have a lot of fox and deer sightings. Nothing like seeing a neighbor's huge orange cat go leaping over a 6ft. fence and a fox follow right behind. Yikes. The cat, however, is and probably always will be just fine. Sadly, I never did see that particular cinematic gem, John, but I hope the coyote lived happily ever after and never had to learn how to line dance. Wear your bike helmet when you emerge from the bunker! They are a strangely social animal, aren't they, Mr Anchovy? Very comfortable with a certain degree of human contact and well adapted to all sorts of habitat. You may not have seen any wildlife, other than the squirrel variety, in a while, WC, but when you do have critter encounters, they are truly close. Of the third kind, even. I love the photos that you occasionally post of bears about town. Sadly, I have not been up to any mischief lately, Moxie, and I am more than overdue. Perhaps it was a message. The UVic bunnies look like they are of the cute cuddly variety, Toccata, not at all like the massive jack rabbits that live around here. I think Coyote would think he was at a lapine buffet if he were shipped to Victoria. We think our old cat had an encounter with a fox early one morning, Lesley. It instilled in her a habit of being very cautious and alert when leaving the house. The new one just dashes out like a toddler escaped from the clutches of the babysitter. Our squirrels are quite feisty, what with 3 oak trees in the back yard. "Dancing for its breakfast" - love that line. I encountered a bear in my front yard a few weeks ago, and that was quite scary. They are definitely not scared of us. Thankfully, I locked myself in my car and he hadn't seemed to master the power lock system, so lost interest in me. Do they hurl acorns at people, Flannery? I likely would, if I were a squirrel. It's very fortunate that bears lack opposable thumbs and knowledge of auto technology, Al. That was a crazy encounter. And it's not like you were living in the middle of the bush or anything.